Master Keaton is a man of many talents, including consulting for insurance firms on difficult cases that take him all over the world. Getting caught up in religious wars, revenge-fueled drug trades, and art forgeries, Keaton shows many sides to his nature but the whole isn't as interesting as its parts in a first volume that honestly was a little disappointing. As I write this review, I'm in the process of still finishing my reading runs of Monster and 20th Century Boys, partly due to time, and partly due to the fact that I enjoy them both so much I'm in no hurry to reach the end. I've written about the early volumes of those manga (here's Monster Vol 1 and here's 20th Century Boys Vol 1) and exactly why I liked them. Unfortunately, while both of those series clicked with me immediately, Master Keaton is off to a rough start. It is entirely possible that the big problem here is that Urasawa is the artist, not the creator. I'm not knowledgeable enough about Japanese comics creators to be familiar with the two writers given story credit, but if they did do most of the heavy lifting in the early going, it would explain why it seems like there are Urasawa trademarks in the plot, but those concepts don't work as well this time around. There are definitely similarities, particularly with Monster. The main character is a likable person who is brilliant at his trade but somewhat off-putting socially. While the character has Japanese ties, the story goes to other countries, specifically Germany. Keaton is able to do things most humans can't, and is able to survive under stress. He also pursues various figures across the stories, though for a very different purpose. The theme of the end of the Cold War is very strong as well, and the characters are extremely heavily focused on men. The problem is that Keaton himself just lacks personality. He's a cipher. Everyone around him emotes freely, but he's distant, and not in an interesting, Sherlock Holmes sort of way, either. When he's in danger, there's no sense of impending loss, other than the fact that there wouldn't be more chapters. I immediately took a liking to the boys who've grown up and must solve the mystery from their childhood games. The doctor and his quest to stop Johan, no matter the personal cost gives him life. Keaton? He's just a really smart dude trained in, it seems, damned near everything. It's not any fun. And that, I think, is the crux of the problem. The comic is as gorgeous and detailed as any of Urasawa's other series. His characters, which mix Japanese and Western styles, are distinctive and flow across the page. There's a great sense of moment, even when the script falls into Chris Claremont territory and threatens to talk the characters to death in its desire to explain what's happening. 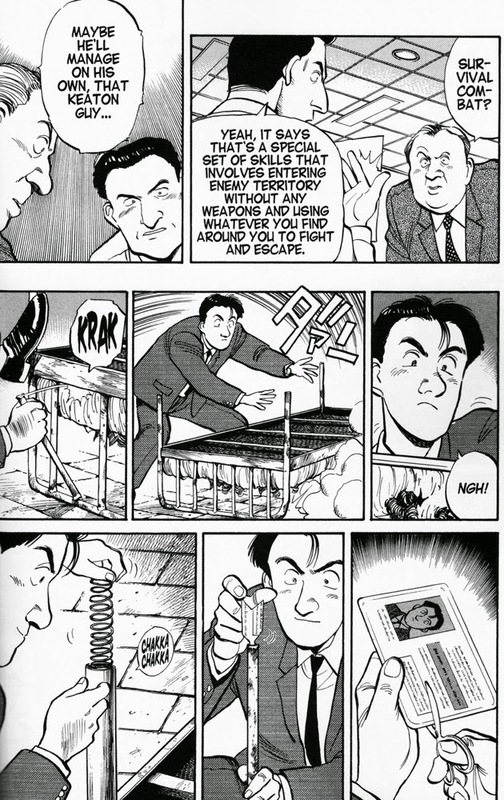 I love the little facial expressions that Urasawa gives his characters. They emote so much to the reader, just by a furrowed brow or some shading on their cheeks. A quirked eyebrow tells ten times as much here as a line of dialogue. So many of these panels are packed tightly, too, which makes the detail work on the characters impressive. Most might reduce them to near sketches, but Urasawa will even draw the nose on a person in the background of a crowd scene, something that's rare in my experience with manga. There's still white space behind talking heads, but more often than not, he's giving the reader at least a hint of the background, so we aren't lost in all the scene changes. Urasawa is one of the best Japanese artists I've come across, and that's no exception here. I just wish I liked the overall plot better. 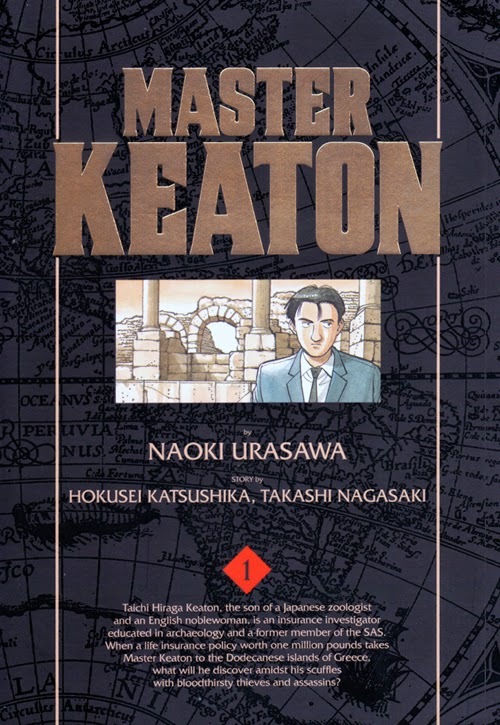 In the end, Master Keaton is not a place to start if you've head about Naoki Urasawa and wanted to start with something that isn't 20+ volumes long. I really wish it was. But between the somewhat dated material (the late Cold War just doesn't hold up well on modern reading, at least not for me, even though I lived through it), a main character who is as bland as a Vince Colletta ink job, and a plot that sees Keaton doing far too many things over 300 pages, it's just not an entry book. On the other hand, if you love Urasawa and need a new fix, this is worth it for the art. Just don't expect a lot out of the plot and dialogue, which is sadly not up to the level of the linework.